THIS IS THE PROPOSED master plan for the new Pioneertown as conceived by Will Hanson. If one listens closely these days, one will hear strange sounds disturbing the normal stillness of California’s high desert. These are the sounds of men and machines as they preside at the birth of a city. This new city is the California Golden Empire, a multi-million dollar. 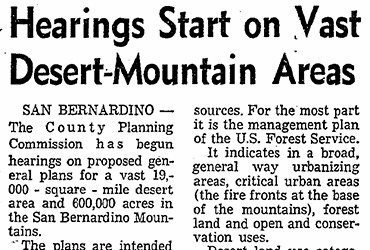 30-square mile development, now being carved out of Southern California’s beautiful high desert near Yucca Valley, only 25 miles from Palm Springs. A prime factor in the growth potential of the high desert is the unparalleled weather. The Golden Empire is situated 4000 feet above sea level, and the cool breezes that flow off the San Bernadino Mountains in the background also protect it from excessive high temperatures. The California Golden Empire enjoys a year round average temperature of a pleasantly mild 70 degrees. 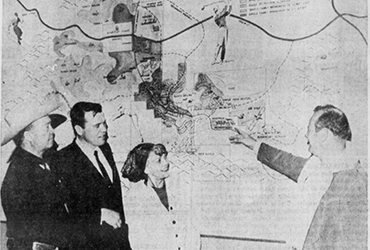 Head of the California Golden Empire, Benton Lefton, formerly of Cleveland, envisions a master planned resort and residential community with more than 35,000 residents by 1975. In direct contrast to the sounds of this new city being born is the sight of an old town being revived. At the entrance to the New Golden Empire development, as you drive up through the breathtaking rock formations that border the wide paved road that winds up from Yucca Valley, is a picturesque replica of the old west, and the scene of many an exciting Hollywood western saga, Pioneertown. 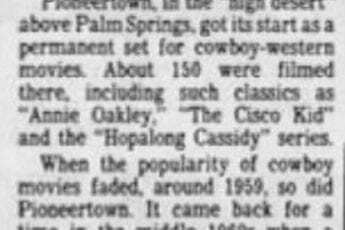 Pioneertown, which has been dying of neglect since the film companies moved out in the late 50’s has been purchased by Lefton, lock, stock, and stagecoach, and is being restored and expanded to become one of Southern California’s outstanding attractions. Responsible for the design and creation of the new Pioneertown is Will Hanson, leading Southern California designer, who is no stranger to this type of project, having been closely associated with the motion picture industry in the creation of motion picture sets and production design for Universal Pictures and Paramount Studios. The first phase of development comprises of only 2,000 acres of the total 21,000 acres and involves preparation of 15,000 lots. The civil engineering is being done by the Gordon J. Jennings Co. This first phase also involves about 10 acres for commercial zoning,30 acres for trailer parks, 130 acres for multiple-unit residential development, and 1,650 lots ranging from small to large. Lots will be priced from $3,500 to $8,000. Multiple unit lots will be offered at $9,000.